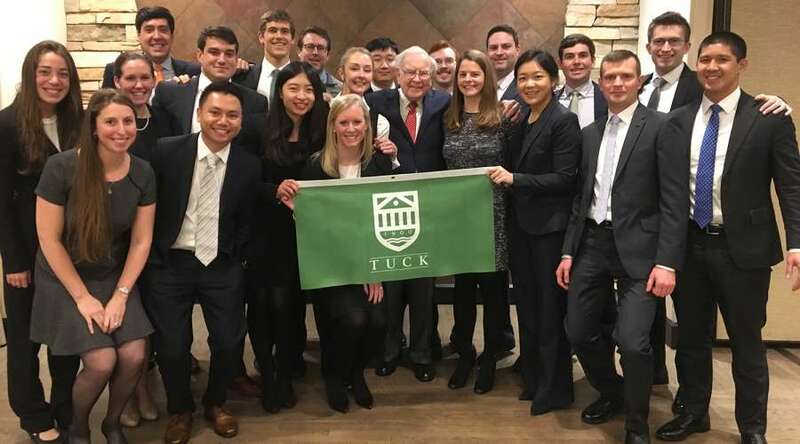 Last weekend, the Investment Club took 20 Tuck students to Omaha, Nebraska to meet Warren Buffett. We spent the morning at a Berkshire Hathaway subsidiary called Nebraska Furniture Mart, the nation’s largest home furnishing store. Rose Blumkin (“Mrs. B”), an immigrant from Russia who came to the U.S. in the early 1920s, started the company in the basement of her husband’s pawnshop. Her philosophy was, “Sell cheap and tell the truth.” She hated debt, so she held a giant warehouse sale to blow out her inventory and made enough cash to pay off the bankers. The company grew, opening stores in Kansas City and Dallas. Chief Strategy and Development Officer Jeff Lind told us, "When we go to a market, we go big. We try to be market dominant wherever we go." The first company to sell the $150 “mermaid pillow” covered in sequins, Nebraska Furniture Mart received orders by the thousands after a video went viral on Facebook. We met Warren Buffett at Anthony’s steakhouse for an open Q&A session with a few other schools. Here is some wisdom he imparted and life lessons he shared. You are at an age when you can determine the person you want to be. Think about your heroes: they’re leaders because they behave in a way that makes people believe and follow them. What do you admire most in other people? You can emulate those qualities. After lunch, we visited two other Berkshire subsidiaries. Borsheims is a jewelry store with a business model similar to Nebraska Furniture Mart: “sell, sell, sell, and watch the floor.” They offer inventory at low prices and are committed to building customer loyalty. Borhseims buys in breadth with little depth to focus on customization and uniqueness. The store is proud to be part of special moments in their customers’ lives, such as selecting an engagement ring, and their diamonds are either created in labs or ethically sourced. Oriental Trading Company is a party supply store with the vision, “To make the world more fun.” When the company declared bankruptcy in 2010, Berkshire Hathaway acquired it within 45 days. Though most of their marketing is print, most of their orders are online. We toured the fulfillment center, a massive warehouse of conveyor belts, fans, and cardboard boxes. The company is increasing safety and efficiency with a “pick to voice” system: instead of a clipboard, warehouse workers wear headsets connected to small wearable computers that tell them where to go and what to do. I’m so grateful to Tuck for the opportunity to meet Warren Buffett. He is an inspiring figure, and he truly believes that we can all positively impact the world of business.